Alan Vlach and Al Wachlin Jr.
Barns and Back Roads features work by Alan Vlach and Al Wachlin Jr. who each photograph the built environment of rural landscapes, addressing the evolution of the country’s industrial fabric. Wachlin’s portfolio documents the changes in Maine potato barns in Aroostook County. 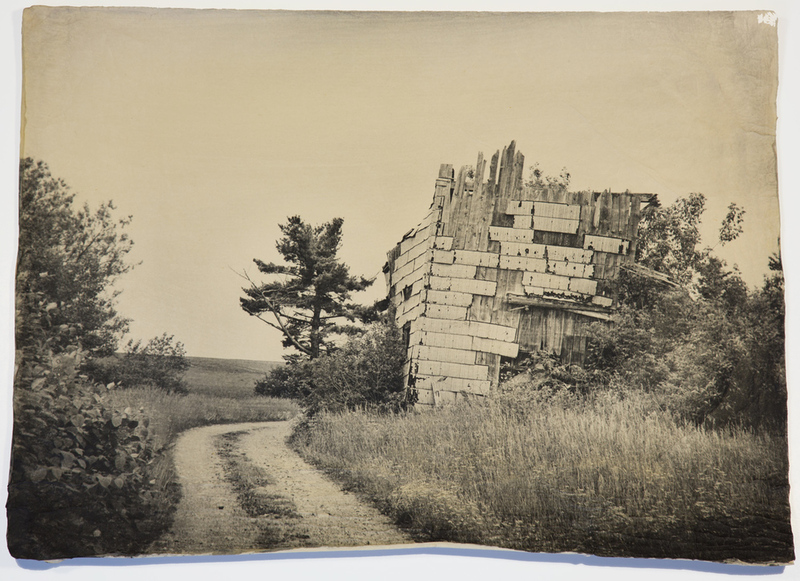 He represents older, often broken down, structures through silver gelatin prints on distressed, hand-made paper, while the modern barns are revealed to us in color, on aluminum. Alan Vlach’s photographs stem from his travels down back roads searching for remnants of a past that is rapidly disappearing in the midst of factory farming, strip malls and fast food restaurants. The images depict subjects including Southern storefronts, decaying houses, and abandoned Midwestern farm buildings. Vlach uses modern technology to capture the images, but prints them using the historic processes of salted paper and palladium. Together these bodies of work present physical reminders of fading traditions and changing industries. Al Wachlin Jr. is a fine art photographer based in Philadelphia. He first became interested in photography while attending Northeastern University. This interest continued and grew after transferring to Temple University where he studied finance. He is not just an artist, but also an organizer. In 2001 he co-founded the Light Room, a non-profit darkroom, with the mission of promoting photography in Philadelphia through community outreach, public exhibitions, and darkroom facilities. He has coordinated studio tours and help to host artist exhibitions including two regional photography competitions. In the past fourteen years he has been a part of numerous group and solo shows. Alan Vlach is a fine art photographer with a deep commitment to the traditional darkroom while fully embracing new technologies. He works extensively with digital enlarged negatives and historical processes as well as digital printmaking. In 1999 he began a formal study of the medium with George DeWolfe. Since then, he has attended workshops with Marilyn Bridges, George Tice, Tillman Crane, Brenton Hamilton, Sean Kernan, Mark Nelson, Josephine Sacabo, Paul Taylor and Lewis Kemper. In 2004 – 2005 he attended the Certificate Program at Rockport College. In 2006 he began capturing images digitally, working in Photoshop to create enlarged negatives and positives for use in historical processes including platinum/palladium, kallitype, salted paper, cyanotype and, most recently, photopolymer gravure. He has been teaching at the Maine Media Workshops since September 2007. Alan resides in Trenton and Portland, Maine.